Due to increased demand, our current lead time for prewired assemblies is 6 to 8 weeks. Our circuit is based predominantly on the 70s EB-3 electronics, with several improvements as outlined below. Only the finest electronic components are used and we offer a couple of options with regards to the type of signal capacitors and choke. Overall, the circuit employed by Gibson from 1971 onwards was in improvement over the design from the 1960's. One such improvement was that the choke was entirely removed from the circuit in all but position 4. However, one negative some feel plague both the 60's and 70's design is that position 4 sounds awfully thin and nasal. 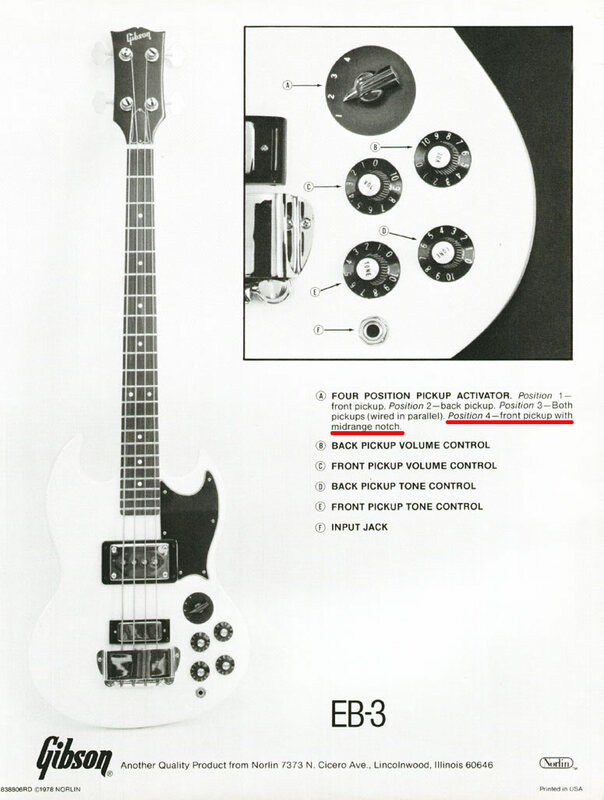 This sound is contrary to how Gibson advertised position 4 as being a "midrange notch" (see 1970's advertisement from Gibson). A notch filter (by definition), is a filter that passes all frequencies except those in a stop band centered on a center frequency. For example, if Gibson wanted to achieve a midrange notch, they would have wanted to pass all frequencies, except those centered around 800 hz - 1 kHz. If they wanted a lower midrange notch, they would design the notch to be centered around 300 - 500 hz. None of the above should sound thin and nasal, as most report position 4 sounds. With that in mind, we have provided 2 tweaks to the Gibson 1970's circuit. We have provided a true midrange notch in position 4, centered around 800 hz. Our position 4 does NOT sound thin and nasal (hear sound samples below) and will be more useful. 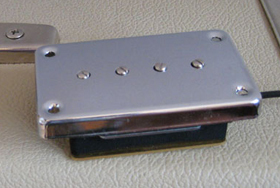 We have added versatility by providing a variable passive overdrive for the neck pickup, engaged via a push-pull pot. The passive overdrive has been voiced to work specifically with a very hot Mudbucker style neck pickup. As is the case with the Gibson 1970's design , the choke/filter is only in the circuit when the rotary switch is dialed into position 4. There is absolutely no residual filtering in the other 3 positions. Furthermore, we have provided a true midrange notch in position 4, centered around 800 hz.. Our position 4 does NOT sound thin and nasal (hear sound samples below) and will be far more useful. We experimented extensively with many different combinations of diodes, and have the determined the best sounding combination of diodes voiced to work with mudbucker style pickup in the 30K range. 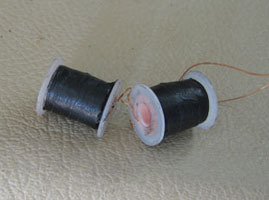 We have these diodes configured to be antiparallel (connected in parallel but with their polarities reversed) to provide symmetrical clipping. The clipping is engaged via a push/pull pot. When the P/P pot is in the "down" position, it functions as a normal tone pot that cuts treble as you roll the pot counterclockwise. However, when the P/P pot is in the "up" position, the pot functions as an overdrive control. When the pot is rotated fully clockwise (on 10) you get maximum overdrive. 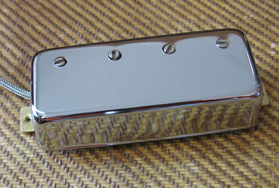 Please note: the diode clipping is voiced specifically to work with a mudbucker style pickup in the 30K range, such as the Curtis Novak Mudbucker reproduction pickup. EB3 wiring harness depicted below with MOD Paper in Oil capacitors, and Curtis Novak hand wound choke. Solderless EB3 wiring harness depicted below with orange drop caps, stock choke, and Novak Pickups. 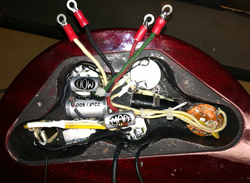 This is an versatile and unique setup for your EB bass that is still respectful of the vintage EB wiring. It features a 4 position rotary switch as well as a push-pull pot, that when engaged will kick in a pair of diodes to give you an overdrive ala Jack Bruce. The harness will work with any pickups, but the diode clipping is specifically voiced to work with either a genuine original mudbucker in the 30K range, or the Curtis Novak faithful reproduction of the original mudbucker. Neck Tone housed on push-pull pot to switch between variable tone vs. variable passive overdrive. When the P/P pot is in the "down" position, this functions as a normal tone pot that cuts treble as you roll the pot counterclockwise. When the P/P pot is in the "up" position, this pot functions as an overdrive control. When the pot is rotated fully clockwise (on 10) you get maximum overdrive. Same as above only without the diode clippig. Rothstein Guitars is an AUTHORIZED DEALER for CURTIS NOVAK PICKUPS which means any pickups you purchase purchase from us carries the full manufacturer's warranty. CURTIS NOVAK PICKUPS- These are simply put incredible hand-wound pickups then check out Curtis Novak. Curt has been hand winding pickups for 20 years and has studied the methods of the masters. He is quite adept at "scatterwinding" which many feel is one of the secrets to great tone. Each You may select between the following capacitor choice. Please note each assembly comes with 3 capacitors, so if you select one model, that will apply to all 3 capacitors. 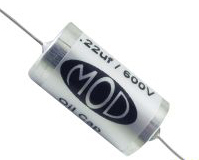 NOTE: The MOD oil filled capacitors are no longer available in the proper values, however we can substitute various NOS PIO capacitors for a $35 upcharge. SWITCH HOLE: You might need to slightly enlarge your existing rotary switch hole for our rotary switch to fit. This is a safe procedure, and we recommend using a tapered reamer and NOT a power-tool such as a drill or dremel. POT HOLES: If you have an import EB bass, those models use the cheaper metric pots, and therefore have corresponding holes drilled for the metric pots. These holes will be too small for the 3/8" diameter pots provided with your Rothstein prewired kit and your existing holes will therefore need to be enlarged to 3/8" to fit properly. KNOBS: If you have an import EB3 with metric pots, your existing knobs will not fit on our pots. You may purchase knobs from us as indicated above. Installation will be easy. The assembly comes prewired, except for the pickups so you will need to make exactly four solder connections, plus your string ground. Each pickup wire will need to be soldered to an assigned color coded lug and we will provide detailed instructions, as well as heat shrink tubing to insulate the connection. You will not need to do any routing to install this assembly. We are now offering a solderless option (see info below). 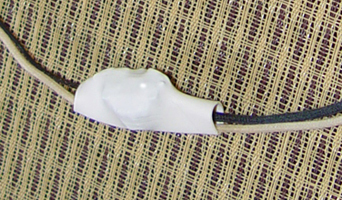 We offer a solderless option when purchasing prewired EB assemblies with pickups for a $35 upcharge. 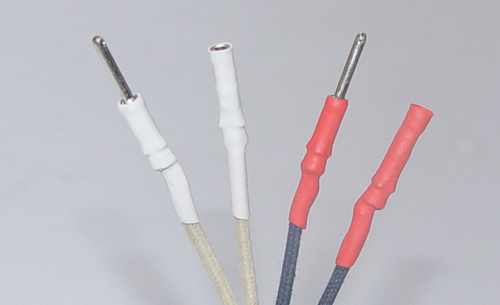 We can wire your assembly with pin and socket connectors, thus eliminating the need for soldering. The pins and sockets are color-coded, so all you will need to do is match the colors and connect corresponding male and female connectors. 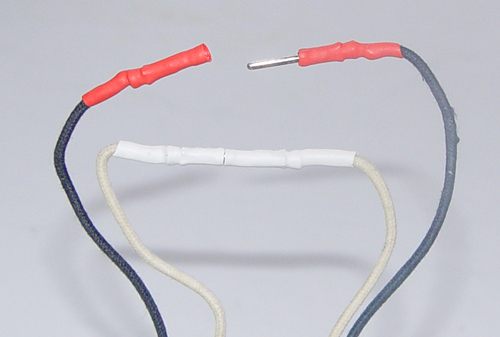 Your assembly will include 4 pin/socket pairs, as well as an additional wire to function as your string ground. This additional wire won't wire won't have a pin/socket connector. You will simply need to lay the exposed part of the wire under the bridge plate. Each assembly is hand wired and tested one at a time to your specs so turn around time is approximately 3-4 weeks. Pre-wired assemblies are custom made one at a time for you to your specs and thefore cannot be returned for a refund since the parts cannot be sold as new.